My usual source for weather information is the National Weather Service’s rather nice site weather.gov. It shows everything from the basic forecast to detailed hourly forecasts in graphic and text formats. This was having issues loading at one point today (load/use, I presume), so I headed over to The Weather Channel at weather.com to use their services. 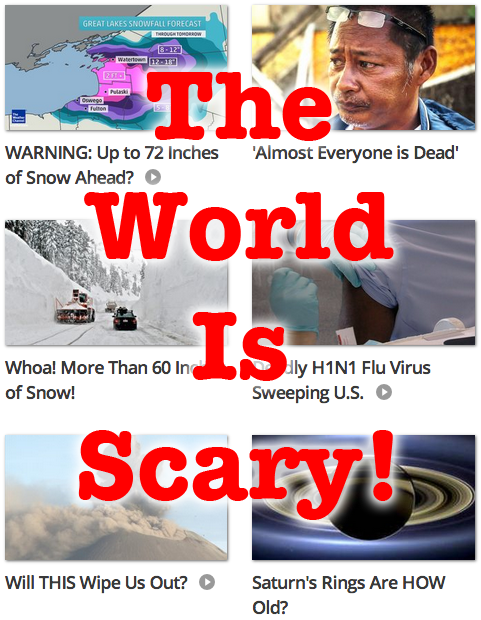 These aren’t even the typical clickbait Elsewhere on the web / “You wouldn’t believe…” ads, but actual links to pages within the weather.com site. Fear mongering for selling things (products, politics, or revisits to websites) are nothing new, but as someone who rarely watches broadcast news or visits sites such as The Weather Channel I can’t help but be taken aback at the naked hype.